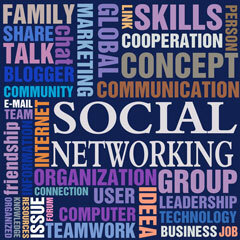 A social network can be simply defined as a group of friends, colleagues, or other contacts. While most people have multiple social networks in their lives, the term is used most often to refer to an online community sharing similar interests, or a website that facilitates social networking online. Founded in 2004 and originally populated by college students as a way to keep in touch with family and friends, Facebook has seen a large increase in users of all ages as well as businesses who use the site for networking. Facebook allows for easy information and multimedia sharing and is now one of the most trafficked sites on the web, growing by an estimated 10 million users a month. Started by Google in 2011, Google+ has many of the same features of other social networking sites, but is differentiated in part by its use of "circles" which allow users to group friends into categories and share accordingly. This is useful because it follows how humans interact offline; we don't share the same information with a professional colleague and a best friend, for instance. Google+ also allows users to video chat with several friends at once. LinkedIn was launched in 2003 as a way for professionals to connect with each other and has since gained status as the largest professional network on the Internet with over 120 million members worldwide. LinkedIn allows users to make professional connections, follow companies, and post resumes to stay ahead of the game in the business world. Meetup.com was founded in 2001 for the express purpose of helping people form offline clubs and friendships based on interest and geographical location. Meetup.com allows users to join groups of interest, be put on waiting lists for new groups to form, and organize and facilitate their own groups. The site currently has 9.5 million members worldwide involved in groups spanning 90,000 topics. Founded in 1999, CodeProject is a community of software development and design developers who are joined together with the common goals of learning, teaching, and having fun programming. Developers from around the world come together to help their fellow programmers by sharing source code, tutorials, and knowledge. Founded in 2011 in partnership with Vox Media, The Verge covers the intersection of technology, science, art, and culture. It offers in-depth reporting and feature stories as well as breaking news coverage, product information, and community-produced content. Social-Media-Pages.com. All rights reserved. About us.